Squarespace and WordPress is a rather tough confrontation. Why? Firstly, because both services are very reputable and have millions of active users. Secondly, because the former is a website builder, while the latter is an open-source platform. It’s like comparing the strength of boxers belonging to different weight categories. Nonetheless, one day you can find yourself deciding between these two services for your next online project. Which one to choose Squarespace or WordPress? Read this review to find out the benefits and disadvantages of these web publishing solutions. Important note: in this review we’re going to analyze the self hosted version of WordPress (WordPress.org), which is more popular and scalable than its online, ‘.com’ counterpart. Squarespace. The latest version of Squarespace is much easier than its predecessors. Its interface is cleaner and less complicated. To create a website, Squarespace users don’t necessarily have to know how to code. Unless you want to get under the hood, the builder is completely code-free. At this point, the key advantage of Squarespace over WordPress is its coherence: you get everything you need to design, customize, publish and maintain a website in one place, with all the heavy lifting done by the system (hosting, maintenance etc.). WordPress. WordPress is a rather intuitive CMS, but it still has a slight learning curve. If you know what it takes to get a site online, WordPress can be a great option. But if you’re looking for an ‘all-in-one’ platform that supports WYSIWYG and drag-and-drop editing, you’d better opt for a site builder. Squarespace vs WordPress. The answer seems obvious. Of course, the site builder is easier than the open-source CMS. While Squarespace is mainly targeting the end user who has no idea about how websites are being made, WordPress is meant for those who know a thing or two about website creation. 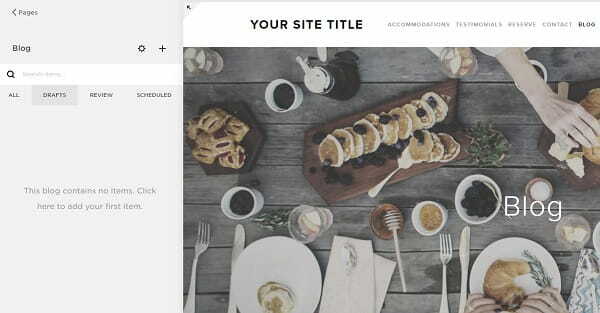 Squarespace includes a library of themes, ready-to-use widgets, and hosting. This is a secure, managed hosting platform, which means you don’t have to do anything in terms of hosting. With WordPress, you have to purchase and manage a web hosting account yourself. This is both a disadvantage and advantage. It’s an advantage, because in WordPress you have full control over your site and can transfer it to any other provider, at any time. It’s a disadvantage because website maintenance is a complex process for a newbie. eCommerce. Squarespace gives the ability to sell both tangible and digital goods, ShipStation integration, Stripe and PayPal support, customizable order confirmation emails, the ability to add store managers who’ll have control over inventory, but not the rest of your website, data export, coupons, taxes, and more. Blogging. Squarespace blogging engine supports scheduled posts, built-in Google Author Rank, tag support, post display options, multiple author support, geo tagging, customizable URLs etc. Importing and exporting. You can import your blog content from WordPress, Blogger, Tumblr or Posterous. Import products from BigCartel and Shopify. You may also export your Squarespace content to WordPress. Multiple contributors with different access levels. 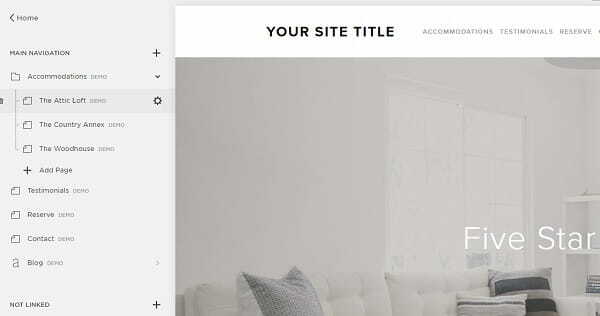 Squarespace gives access levels include Administrator, Content Editor, Billing, Reporting, Comment Moderator, Trusted Commenter, and Store Manager. Connected services. Squarespace provides Dropbox file synchronization, simultaneous posting (auto-posts to Twitter, Facebook or Tumblr). 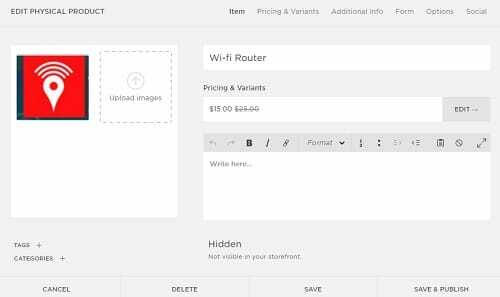 Moreover – you can import your blog from WP to Squarespace. For power users, Squarespace offers Developer Platform, where you get full code control, from the opening doctype tag to the footer. Besides, all templates are exposed via Git, meaning that you can work with a team and roll back changes easily. WordPress. WordPress is very flexible. Whether you need to build a webstore, a portfolio or a blog, WordPress can be the right choice. Thanks to the extensibility of the platform, you can create almost any website imaginable. However, you should know that almost any new feature in WordPress requires a plugin, be it an SEO pack, a social media plugin or a commenting system. Though these are quite easy to install and configure, the flipside of this concept is that over time your website accumulates many plugins which can overlap and also make your WordPress website heavier. WordPress vs Squarespace. Though WordPress seems more flexible, I wouldn’t call it the clear winner. It depends on your needs. Don’t get caught up in the “more is better” mentality, unless you really need it. But you should also realize that if your website expands outside of Squarepace’s capabilities, and you don’t want to sign up for the Developer platform, you’ll have to migrate your website to a more scalable platform. Squarespace. 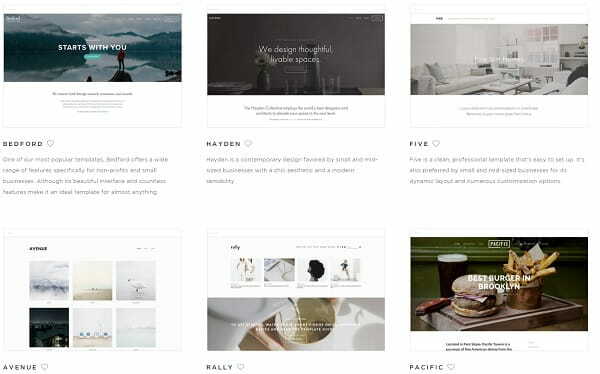 Squarespace offers 105 beautiful templates for websites and only 12 templates for online stores. Every design automatically includes a mobile version that matches the overall style of the theme. Custom CSS can be applied to any template design. You can switch Squarespace templates, but it’s important to note that certain changes may not carry over to new templates.So we advice you to test several templates before final choice. WordPress. There are loads of both free and paid themes for WordPress out there. However, it can take you awhile to learn customizing them. The best place to find quality WordPress themes is the official theme directory. In case you decide to go with a free WordPess theme, make sure it’s malware, suspicious backlinks and scrips free. Theme customization requires at least a basic knowledge of CSS and HTML. In some cases you need to know PHP language for deeper customization. Squarespace vs WordPress. Squarespace designs work seamlessly and don’t require installation. WordPress offers a greater selection of themes, but their quality is sometimes arguable. Make sure you get a WordPres theme from a trusted provider. Squarespace. Squarespace has an impressive knowledge base. They also offer live chat, support through the Community Forum and email support. Squarespace also holds regular one-on-one workshops that take place in their Customer Care headquarters in New York and Portland. WordPress. There are thousands of video tutorials, forums and other resources offering detailed guidelines on creating and maintaining WordPress-powered websites. But there’s no phone number or email to call for help. WordPress vs Squarespace. Squarespace has fewer customers than WordPress, and they can serve all of them via live chat, email or their well-structured knowledge base, while WordPress has no support staff at all. Squarespace. There is no free version on Squarespace, but you can try it free during a 14-day trial. They offer three packages in case of annual subscription: Websites ($12-18/monthly) and Online Stores ($26-$40/monthly). The price depends on the website size and subscription period. All annual packages include a free domain name. If you’re looking to build a simple portfolio site or a blog, then the cheapest version of Squarespace will certainly handle it. To get access to the Developer platform you have to subscribe either to the Professional or Business plan. The Business plan is meant for webstores. It includes unlimited products, integrated accounting by Xero, and other eCommerce-specific features. WordPress. It’s free. However, you’ll still have to pay for hosting and your domain name. Besides, you may have extra expenses (paid templates, plugins, etc). If you have no prior webmastering experience you may also want to hire a WordPress developer. Squarespace vs WordPress. Squarespace plans include free hosting with unlimited storage and bandwidth. The cost of Squarespace, however, may rise when creating commercial sites. WordPress CMS is technically free, but in the long run you’ll still have to pay for extra functionality, plugins and hosting. Choosing between Squarespace and WordPress CMS is a crucial step. If you’re a pro, you will enjoy the flexibility of WordPress at its finest. WordPress is a full, scalable content management system, but it lacks the visual interface that modern DIY website builders offer. If you have no idea about how to find a reliable hosting provider, install and configure a theme or use plugins, you’d better opt for Squarespace. It will help you focus on what really matters – your product/service, rather than technical details. However, with all its advantages, Squarespace does have its downfalls that may drive you towards a more user-friendly or a cheaper site builder.